The master bathroom “sanctuary” is trending! 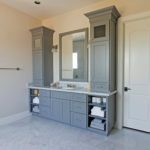 We are seeing more homes designed with his and her bathrooms as well as his and her bathroom spaces, both having the luxuries that make your master bathroom a retreat. Cabinet towers sitting on the countertops offer a separation between his and her spaces. 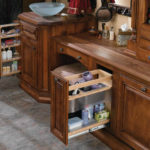 They can be designed with drawers and doors or even open shelving for your towels or decorative items. Creative storage solutions for blow dryers and other small bathroom appliances accentuate the need for functional and convenient storage solutions. Built in charging stations are becoming a need for most homes. The bathroom is an excellent option as it keeps device lights out of your sleeping area – function and design. It doesn’t get better than you master bathroom retreat. Rev-A-Shelf offers adjustable shelves and bins perfect for curling irons and hair dryers.